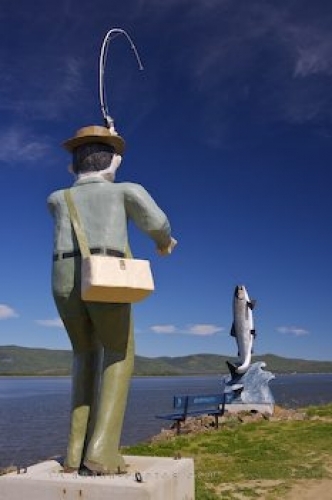 Along the bank of the Restigouche River in the town of Campbellton, New Brunswick, stands a statue of a fisherman with an Atlantic Salmon statue hooked on the end of his line. Many come to the town of Campbellton, New Brunswick for its active fishing and the fisherman statue with the Atlantic Salmon displayed along the Restigouche River, is a reminder of this. People can sit on the bench under the line cast from the fisherman statue and enjoy the beautiful scenery of the Restigouche River. Large Atlantic Salmon have been caught and recorded when coming from this river, especially during the days when the annual salmon festival takes place. Angling and fly fishing are an important source of income for many local businesses in Campbellton, New Brunswick as this river is famous for its supply of Atlantic Salmon. Fisherman and Atlantic Salmon statue along the banks of the Restigouche River, in the town of Campbellton, Appalachian Range Route, Highway 11, Restigouche, New Brunswick, Canada. Picture of an Atlantic Salmon and fisherman statue by the Restigouche River in Campbellton.